flexible installation, easy moving and maintenance. The application of shelter can reduce the cost of construction and maintenance and shorten the timing of network building. The shelter is mainly composed of base, wall, roof, floor, illuminance, air-conditioning, cabling ladder management system, grounding, fireproofing and alarm system. IV. Anti-wind performance:Protect against the 50/s wind-loading without damage. VI. Heat Insulation performance:The thermal conductivity of wall and roof material is less than 0.022 W/m.k. VII. Anti-rust performance:galvanized steel for shelter base frame, color steel for wall board and roof board; aluminum for other connection components and all standard parts are made of corrosion-resistant steel. IX. Useful life:more than 20 years under common maintenance. TEC: Thermal electric cooler . 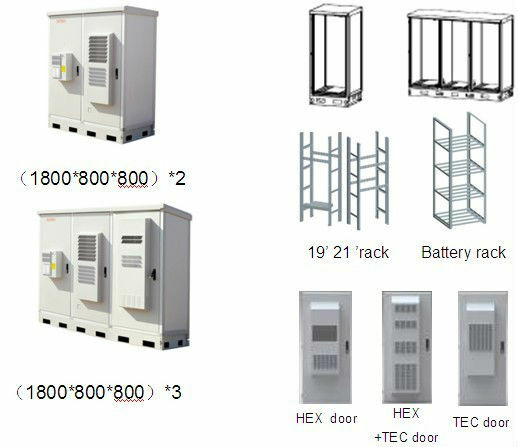 It is suit for cooling battery container. u Multi-lock points design. Extras lock is available.